The boxer is built to suit containers and boxes of different sizes and types. Below are samples of the many different load handling attachments. Whether handling conical or perforated containers, highly reflective steel boxes, deformed, ribbed containers or cardboard boxes, we offer a solution for every type of application. High performance double deep combination telescopic unit to handle (2) x 125 lbs containers. The device has a telescopic table with integrated pull-in belt and stationary lifting bar system for separating loads. This positive engagement gripper and double belt conveyor was designed for double deep box storage with differing dimensions and box weights of (2) x 75 lbs. The double belt serves for separating and preliminary positioning of the loads. 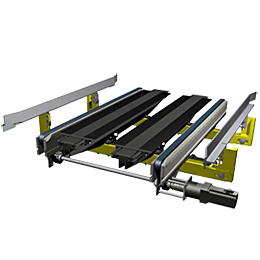 The gripper on the roller bed conveyor was designed for single or double deep storage of unit loads. 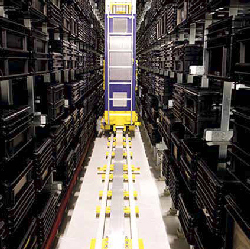 The telescopic grippers allow storage and retrieval of an entire shelf position. Telescopic table handles load weights up to 225 lbs with a short belt conveyor which reduces transfer times. Synchronous servo-drives ensures quick load transfer times. 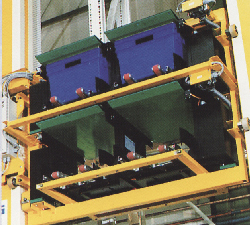 Shown on the right side of the page a boxer load handling unit with 4 individual or simultaneously acting attachment devices. Innovative light-weight design has set new industry standards. Whether a custom design or a ready to use system consisting of containers, conveying equipment, shelving, storage & retrieval boxer , controls and warehouse management interface, our sales engineers are here to assist you with your application. Your never far from assistance with PMH.